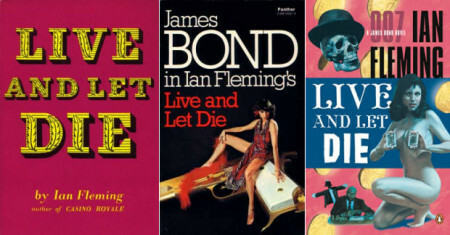 1954 saw the publication of Live And Let Die, set in the US and Fleming’s second home of Jamaica. Full of imagination, it saw a change of pace from the previous book with its descriptions of gambling and paved the way for Bond as an action hero. Mixing voodoo with pirate treasure and SMERSH, the book is the first to introduce Fleming’s fascination with the ocean and once in Jamaica is full of local colour. The film of the same name was the first to star Roger Moore and like most of the films had very little to do with the book beyond sharing the names of the villain, Mr Big, and the girl, Solitaire. Interestingly enough, a scene where Bond and Solitaire are dragged behind a boat over a shark infested reef was later used in the film For Your Eyes Only, and Licence to Kill starring Timothy Dalton was quite obviously, but loosely, based on the book. Live And Let Die is Ian Fleming’s second novel and the first time we find James Bond on both United States and Jamaican soil. Among the highlights is when Felix Leiter takes Bond on a tour of Harlem’s jazz clubs. It is both fascinating and rather dated. It is also curious how Fleming weaves voodoo into the story, including a heroine who seems to genuinely possess psychic powers. Later Fleming’s love of Jamaica and the underwater world is evident when 007 scuba dives to Mr Big’s lair located on the Isle of Surprise. 007 is sent to New York, where he again teams up with CIA agent Felix Leiter, who takes Bond to a number of nightspots in Harlem. They later follow a lead that takes them to St Petersburg in Florida. Finally, Bond sets off to Jamaica for a showdown with Mr Big at his lair on the Isle of Surprise.